Start time for all distances is at 7:00 am at Skyline Park at the summit of Mt. Wilson (Mt. Wilson Observatory parking lot). Check-in and Packet Pick-up: ALL runners MUST check in at the start line between 5:30 am and 6:30 am on race day. There is no Friday night packet pick-up. Course info and Pre-Race Instructions are at 6:40 a.m. at the Starting Line. 25K at 12:00 pm (5 hours). 50K at 5:00 pm (10 hours). 60K at 7:30 pm (12.5 hours). Per Forest Service Rules, race bibs must be FULLY displayed on the Runner's front. Volunteers are needed and very much appreciated: Please email: garyhilliard.rd@gmail.com. 25K awards at 12:00 pm. 50K awards at 1:00 pm (and continuing as needed). 60K awards at 2:00 pm (and continuing as needed). Participant shirt for all registered runners. All finishers receive Finisher's Medal. 25K Men's and Women's winner receive Overall Winner's plaque. 50K Men's and Women's winner receive Overall Winner's plaque. 60K Men's and Women's winner receive Overall Winner's plaque. Divisions: 18-29, 30-39, 40-49, 50-59, 60 & up. 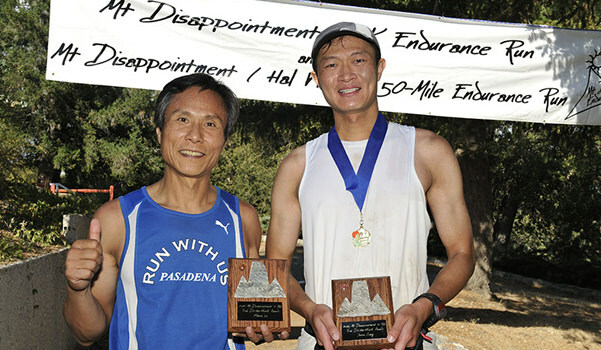 Get-to- the-finish Award (given to a runner who shows true determination). The Ham Radio Operator Award. Big Thanks Award (given by the Race Director). Thanks for the Support Award (given to sponsors and patrons of the Event). There is a fee for parking in the Angeles National Forest. A day pass is $5.00 or a yearly Adventure Pass is $30.00. Adventure Pass must be displayed in vehichle's windshield. You may purchase a 1 Day Pass with your race Entry, or contact the US Forest Service at (626) 574-5200. Crews and family members will have access to runners at the Start/Finish, Red Box Picnic Area, Clear Creek, and Shortcut Parking Area (Silver Moccasin Trail Head) Aid Stations only. All fire service roads will be closed to vehicular traffic (except Event vehicles). See Registration Page for up-to-date fee schedule.